Let me know which you prefer and why. If you’d like to join the fun, please click here for details. If you have any questions about the Phoneography Challenge, please contact me. The intersection between human nature and nature is rarely black and white. This relationship mingles footprints (missteps, almosts, progress, and successes) that have been achieved in the course of our story. Every step has had its daring moments where each has held onto the old, and continued to create the new. We are the sum of this partnership. I am, however, amazed at the lack of commitment that humankind has for its most serious partner in life’s journey. Without Mother Nature we are doomed. On the other hand she can do very well indeed without us. The contrasts and tones of this relationship are steeped within a continuum from grays to whites, from black-and-white to color. This seesaw symbiosis is a prudent example of interdisciplinary blending. Humans seek and find answers in nature’s examples. She really does not need us to cast a net of experimentation, and forge a longstanding place in the mysterious and wider universe. I’ve never really understood why “we” differentiate between Human Nature and Mother Nature. In reality we are one and the same. We are the range of all that the human brain, eye and mind conjures. We are not monochrome, but fully technicolor and awash in the spectrum of hues and tones. Still, I often see the world in black and white, because it helps me deconstruct and re-construct what I visualize. I find it a necessary exercise in comprehension: sweeping away what is typical reality and creating a simpler view. It helps to ferret out the importance of a moment, to focus on its story. In the Lens section are two parts of this conversation: Bridging Human Nature and Nature as well as the Almost Symbiotic Relationship Between Nature and Human Nature. 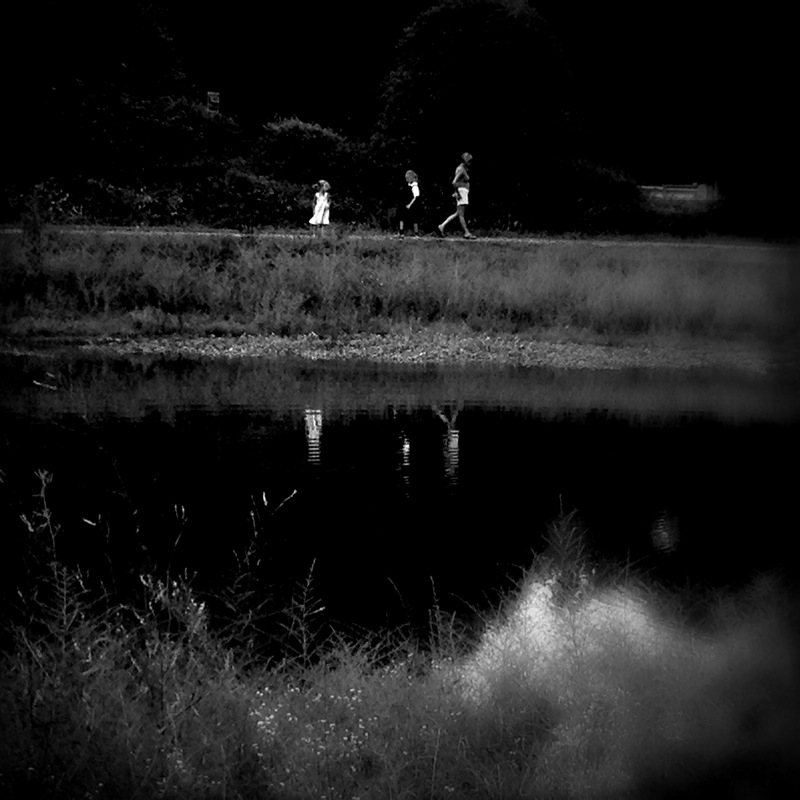 The first was taken at a local park where a trio were strolling on a path above a pond. This delivery of sweet interaction captured my attention. It spoke volumes about the interplay between the silence of nature and us. 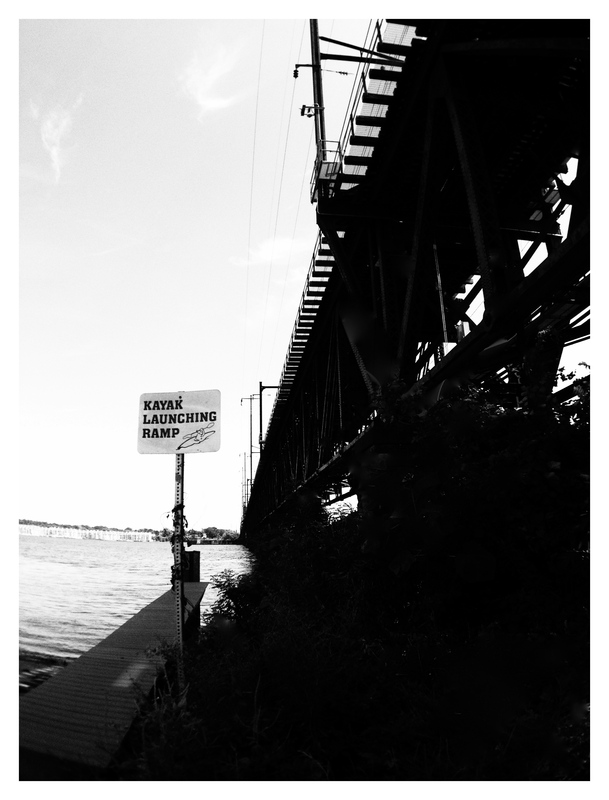 The second image was taken on a recent photo shoot in Havre de Grace, Maryland, which is greatly influenced by its location on the Susquehanna River and at the head of the Chesapeake Bay. I captured the confluence of water, Amtrak rails and Kayak launch. Life in this tiny community is very much woven by its setting on the waterways. There is no avoidance. We are inextricably linked with the genius and mystique of nature. Our dependence and interdependence is an ongoing tale–at least we hope so. Nature inspires my sense of place, which is why my adult life has been steeped in gardening. I care and toil my almost half-acre of land with august enthusiasm. Hardly a day expires without some outdoor activity that includes walking in nature or tending some small or larger part of my gardens. Oh, and feeding my menagerie of birds. So even though I live within this multi-dimensional color-coded life, I am forever viewing it with a monochromatic eye. It does not reduce my pleasure, just adds to its abundance. 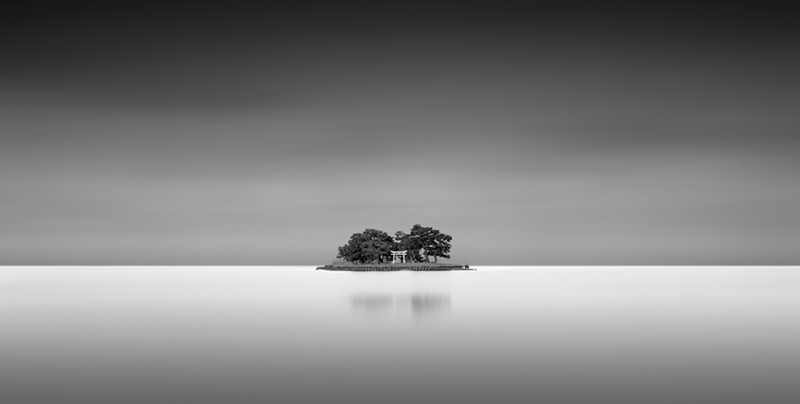 Tip of the Week: Michael Levin is a noted for his extraordinary black-and-white landscapes; they do not just startle, they force you to stare with awe. As if nature is not gorgeous enough, he adds a whole other view of her with his minimalist approach. His eye is adept at framing the most luscious of scenes, which often shock the senses. While his camera of choice is not a Smartphone, it is worth studying his art, his way of seeing the world. View his work here. 4th and 5th Mondays: Challenger’s Choice (Pick One: Abstraction, Architecture, Food Photography, Night Photography, Portraiture, Still Life, Street Photography, and Travel). This entry was posted in Black-and-White Photography, Human Nature, Writing and tagged Human Nature, Inspiration, Nature, Photo Challenge, Photography. Bookmark the permalink. I love the way the first picture creates a mood. Thank you so much for taking time to explain b&w and nature & us. MICHAEL LEVIN Michael photos are stunning! You are very welcome. Thanks for the comment and visit. That top B&W is very nice! Number 2’s perspective, I think may translate well and look stunning in a big print format perhaps? Thanks very kind, thank you. Excellent photos, Sally. I love the contrast both in tones and in content. The first one evokes a lot of childhood longings. I love how the little girl enjoy walking behind the others. Besides I totally agree with you. We are Mother Nature – and Mother Nature is us. The first photograph tells such a sweet story. Elisa, thank you, I agree. I do like the first photo more than the second. It has a mystical quality which I find enchanting. Thanks for the link to Michael Levin. His art is extraordinary. Yes, I agree his work is inspirational. Thanks for your comment. I love the reflection in the first image. Beautiful. Love them both but the bridge that connects humans and nature is just an inspiring visual that makes the reader reflect on the relationship of man with his surroundings. Thanks. I love the reflections in the lake. It seems poetic somehow, and the black and white really adds to the effect. Janine,I do appreciate your comment. Nicole, thank you for your thoughtful comment. I know that I leave you comments. Hope that you are getting them. I just got this one. WP has been really acting up lately!!! I really do love that first picture of yours. Great clicks of B & W. I like both. Here is my entry. Go glad that you have joined the fun. Thanks for your comment. Nice shots, both. My pick is the first one. I really like how you captured the reflections and the rich dark tones you used. Thanks, and happy Phoneography Monday. The diagonal line of the trestle and the ragged edge of the ties really appeals to me this week. Nice photo! I really enjoyed that photo shoot–by the water, underneath the rail, and the sun radiant. Thanks. Carol, I appreciate your comment. Thanks. Thank you, enjoy your week. Beautiful post, all the way around! I like the figures reflected in the water. There is a unity between these two elements. Malc, I felt the same way as I spied them. Thanks. The first one would be my pick. The juxtapositions are strong, Dark/light, seen/reflected. There is a deeper story growing from this one. I appreciate the comment and the visit. Thanks. I like the first one better. There’s something appealing to me about both the reflections and the girl’s dress, as well as the way she’s turned back to the little boy. Janet, it certainly caught me attention. Romping in the park and sharing it with others. Thanks. Yes, it is Monday. Sometimes everyday seems like today. Thanks. Amazing shots. I love the first one. The reflection you captured is amazing. “Still, I often see the world in black and white, because it helps me deconstruct and re-construct what I visualize. I find it a necessary exercise in comprehension: sweeping away what is typical reality and creating a simpler view. It helps to ferret out the importance of a moment, to focus on its story.” So true and the post is such a perfect expression of the concept–the images, the story, the words, the reflection upon the nature of human nature and the rest of the natural order. Really great images and reflection. I like both images, but the first really speaks with the bridge aspect–and the mirroring that must take place in order to realize that we’re also, indeed, part of the natural world. Thanks for sharing Michael Levin’s work. Love it! You are very welcome. Delighted to have you as part of the challenge. Thanks for your comment and visit. I really like the 1st pic with their shadows on the surface of water. Great analytical title for this beautiful image! Laurie, thanks and enjoy the week.